We’ve been playing around with food coloring a lot lately! For years, I didn’t even touch the stuff, but now I find that I can’t live without it. Why? 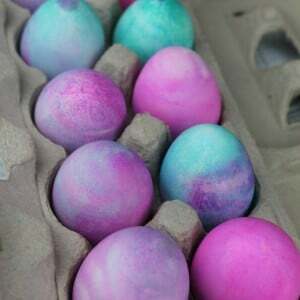 Because food coloring is amazing. It’s fun. 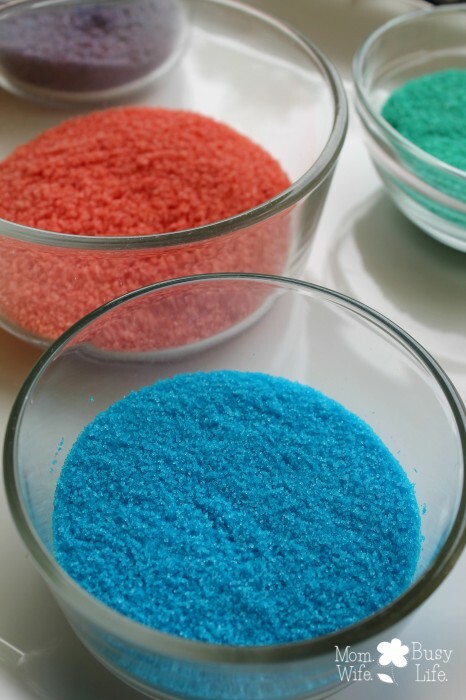 You can do so much with food coloring including fizzy fun, making sidewalk chalk paint, shaving cream rain, color changing milk and now our own colorful sand! With two young kids in the house, I’m always on the lookout for fun and exciting projects to do with the girls! Creating our own colorful sand was something that I’d do again. 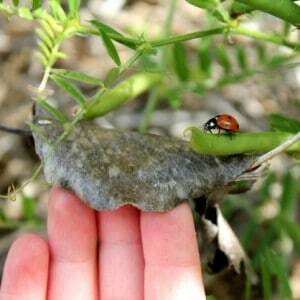 It’s so easy to do and inexpensive as well. All you need is salt, food coloring, and plastic baggies! Pour 1/2 cup to 1 cup salt into a plastic baggie. 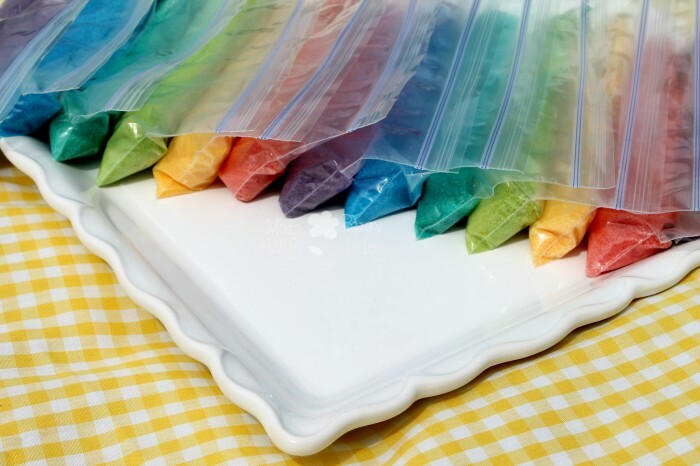 Drop 10-12+ drops of food coloring into the bag. Squish the salt around in the bag until the food coloring evenly covers the salt. 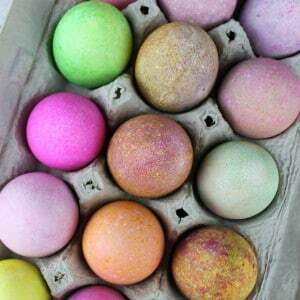 *Add more food coloring for a brighter color. 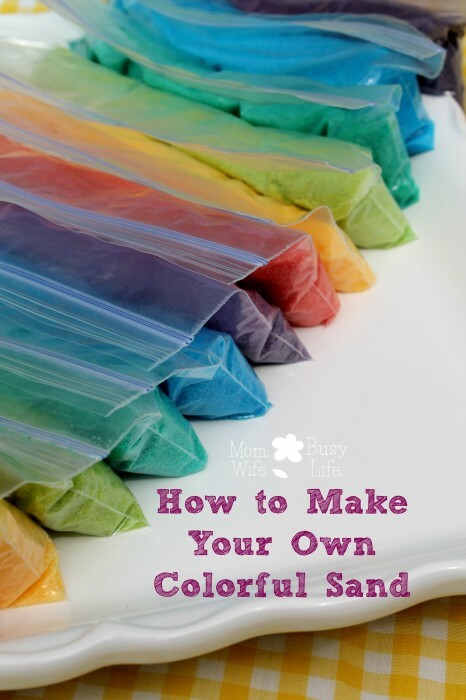 Let the colored salt sit in the plastic baggie overnight to make sure it’s dry. 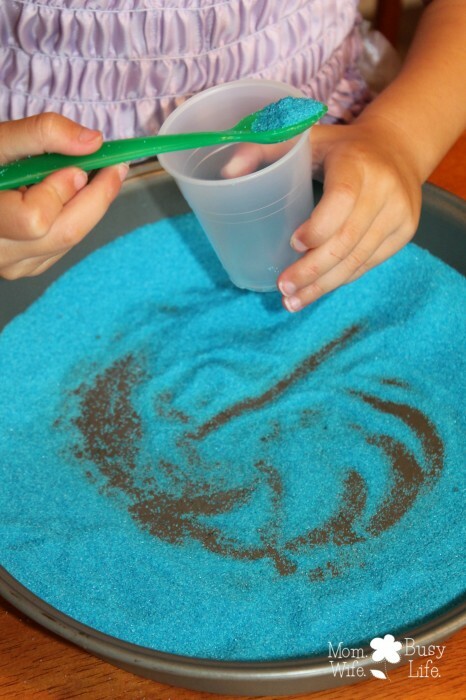 Using a flat pan or plate, allow your child to play with the sand! 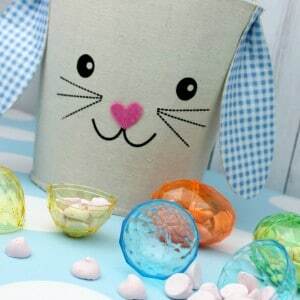 Give them a cup or spoon or other toys they can use to make their playtime even more fun! 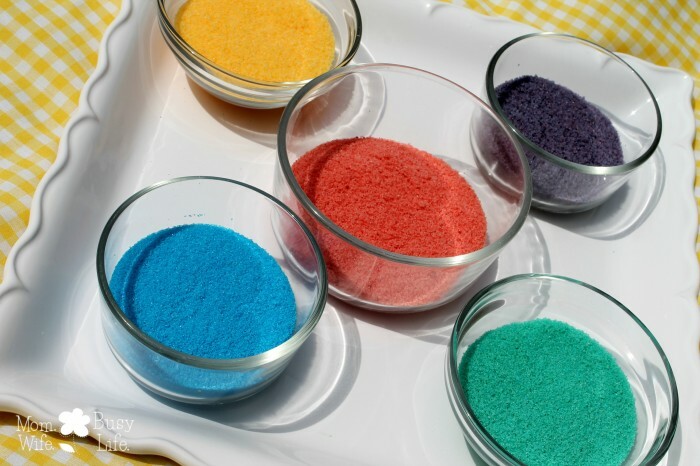 You can even pour the colored salt into little containers and make pretty colored layers with it. *I did receive a question from a reader asking if salt would make hands dry. I didn’t experience this with my own children, but if you think the salt is in fact causing your child’s hands to get dry, I would recommend discontinuing the use. You can also use the salt for just scooping and pouring and avoid using hands in the salt. 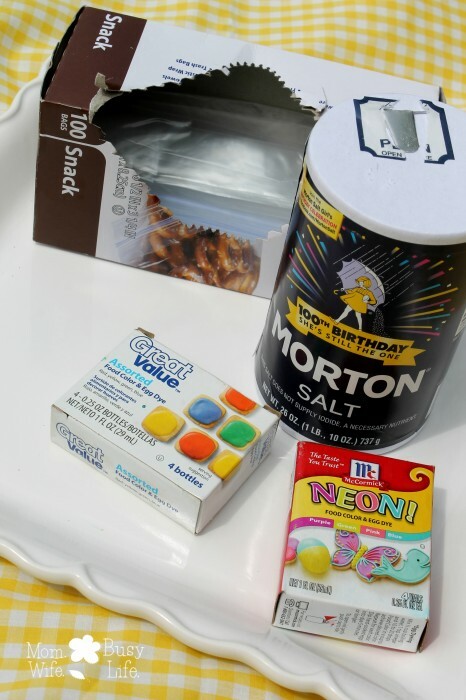 **As with any activity involving small children, monitor your child during this activity to make sure they aren’t putting the colored salt in their mouth. My girls enjoyed playing with their sand! When we were finished playing, we poured the sand back into the bags to save for another day! Try mixing the colors for more fun! Wow! This is so pretty, and looks like so much fun! My daughter would LOVE it for days that she can’t play outside in her sandbox! Great idea! It looks fun!! I will try with my students. Does the salt not dry out their hands though? *Note: I did receive a question from a reader asking if salt would make hands dry. I didn’t experience this with my own children, but if you think the salt is in fact causing your child’s hands to get dry, I would recommend discontinuing the use. You can also use the salt for just scooping and pouring and avoid using hands in the salt. My husband has dry skin issues and uses salt to moisturize it. seems to work for him. 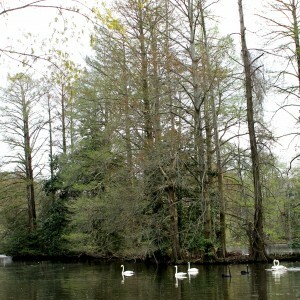 He discovered this after restoring a boat feral cats had nested in over the winter and it was so infested with fleas. He didn’t know they were on him til he saw the bites the next day. I knew salt had a drawing effect so he put handfuls of salt all over him. Took care of the itch and made his skin softer. Do you think you could use actual sand.. I work with children and they would love this but it’s expensive to buy.. I’m thinking sand would also work instead of salt.. What are your thoughts? I haven’t tried using actual sand, but you could certainly try it! As with any activity involving small children, monitor your child during this activity to make sure they aren’t putting the colored salt in their mouth. No need to use sand ?? You could try using sand. I have not. I am not sure the color would show up as well using regular sand. Maybe I’ll experiment with that in the future! I am looking to buy sand for a wedding to put into glass vases. I wonder if this would last long if kept air tight in the vase. I’ve had this colored salt in our activity closet for a few months now and it still looks great. I’ve never tried that before! Sounds like a great idea! This is an awesome n easy idea. I just tried it with regular beach sand n it worked great. 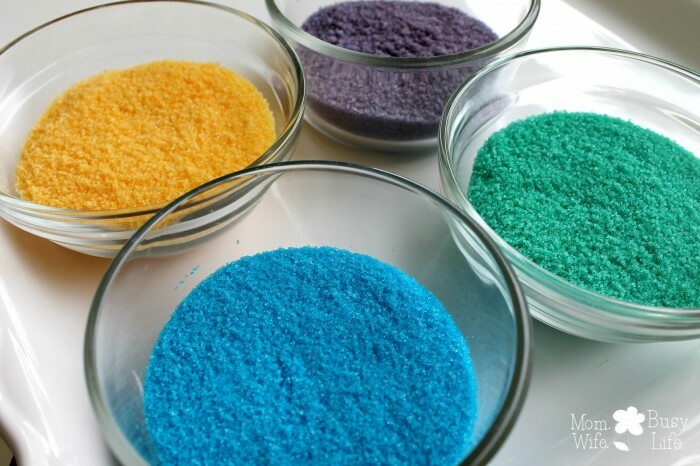 Make your own colored sand for your sand ceremony. O.k. I followed the steps given above using blue food color (for an ocean project) and my sand is green ish not but. Is it because it need to dry? What did I do wrong? Where did u find the food coloring in the pic? All I find is the bold colors and I need brighter colors like teal, coral, yellow etc. Thanks! I found them at Walmart! Could u use gel food coloring?? You could probably use gel food coloring, but I think the liquid food coloring would work a little better! I did use gel food coloring for the first time recently for some play dough I made but I wasn’t a fan and sticking with the liquid kind! This is such a cute little idea!! I would have never thought of something like this. I myself might even enjoy something like this because I am a child at heart. I love this simple and easy. 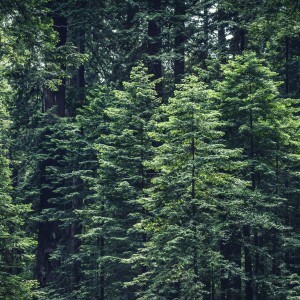 You have such an amazing website!!!! This looks like such a fun idea! Do you use regular table salt, or do you use a coarser salt that won’t break down as easily? I use any kind of salt that I have on hand. I’ve used both kinds actually! Oh no! It also depends on how much food coloring you add to the bag of salt. If you place too much, there may be some excess that will get on your hands. I’m glad you still had a great time. I love this idea, will be trying this for the Halloween holiday season. Which food color did you use to get that the dark purple color? I tried to create that color by mixing blue and red food color but it just didn’t look very purple.